"When can fruit fly lay eggs in their host fruit?" was the simple question posed to the fruit fly expert of the then Department of Agriculture some years ago. The answer was "in the period between before the fruit ripens to the point of it being over-ripe or rotting, on the tree or on the ground under the tree, in the fruit supply-chain, in the shops, in the house, on a compost heap or a worm farm, in garbage bins and on landfill sites". This explains why the fruit fly is so successful, prolific and so difficult to control. The name "fruit fly" means different things to many people, and there are many types of fruit fly. The "Queensland fruit fly" is the one that we are concerned with. Any serious attempt at controlling the incidence of Queensland fruit fly attack should include a full understanding of the life-cycle of the fly, and at each step when the adult fly has access to its host fruit. This item looks at the period when we humans attempt to dispose of any fruit, or parts of fruit, that has been harvested for use and we no longer have a need of. We either send it to landfill or attempt to recycle it into new plant food. 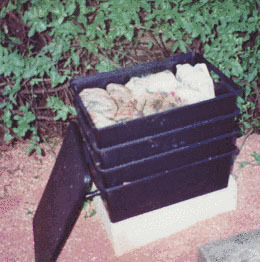 Recycling can include composting or placing in a worm powered unit (worm farm). The basic principle suggested here is to place a paper barrier of some sort between the host fruit and the adult fly. Two methods have been proved successful in lengthy trials, both require a container of some sort to be located near the kitchen sink to collect food waste etc. 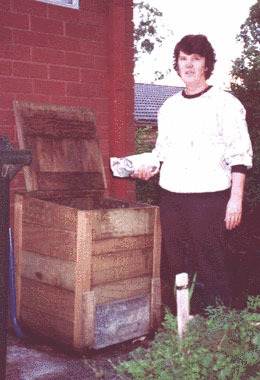 The first method uses newspaper to wrap the scraps to make a parcel in the kitchen, the parcel is then place on a compost heap, in a worm farm or in a garbage bin. A container of 2 to 3 litre capacity is required and the scraps need to be fairly dry. The second method uses paper sacks previously used to hold 12.5 Kg of bakers flour, (no plastic lining). An empty sack is placed either on the compost heap or worm farm and the food waste container from the kitchen emptied into the sack. The waste can contain liquids or wet items such as coffee grounds. One or more additions of scraps can be added before another new sack is required. Effective barrier between fruit fly and their host fruit. Good way of introducing carbon to the normally high nitrogen materials. Keeps the scraps moist for quicker breakdown. Reduces annoyances such as vinegar flies and blowflies. Better appearance, only paper visible instead of rotting foodstuffs. Rein Worm Factory, before legs became available. Trays in the worm farm should be filled to the top with parcels. The next empty tray sitting on the parcels. The material shrinks and the higher tray settles down to sit on its stops; this also increases the capacity of the unit, which was a bit small for us. Additional working trays could be purchased. Adding wrapped wastes to prevent access to scraps by fruit fly. This article by Graham Roberts.